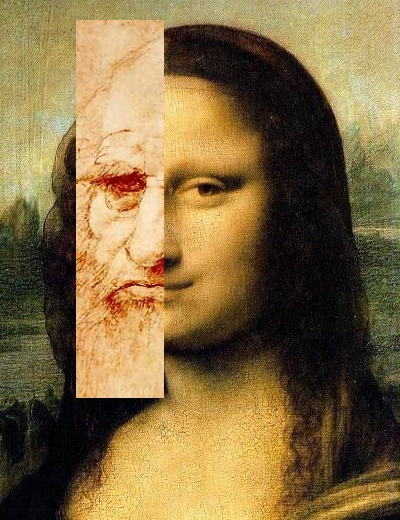 Did you catch the news headlines yesterday about the Italian researchers who hope to open the tomb of Leonardo da Vinci in France in order to reconstruct his face? They are keen to see whether the Renaissance artist was indulging in his well-known love of riddles when he painted the Mona Lisa. For years, some some scholars have hypothesized that the mysterious beauty in the painting was a self-portrait in drag. My first reaction to this proposed project was to shake my head in disbelief. Is this really a valid reason to disturb the sleep of the dead, particularly someone so deserving of our respect? Are we so driven by curiosity that we need to rummage through chill church tombs and peer at the bones of the dead in order to answer a question that is on the level of a barroom bet? And I was not reassured when I Googled the team’s spokesperson, Giorgio Gruppioni, a bioanthropologist at the University of Bologna. In 2009, Gruppioni and several colleagues reconstructed the face of one of Italy’s greatest poets, Dante Alighieri, using the cranial data that researchers recorded in 1921 when officially identifying Dante’s remains. And just a few weeks ago, Gruppioni and colleagues recovered what they hope will be the remains of the great 17th century Italian painter, Caravaggio. Once again, the team announced plans to reconstruct Caravaggio’s face. Gruppioni and his colleagues seem awfully interested in surface appearances. But the more I thought about it, the more I began to see a legitimate context for these projects. For the past two decades, several Italian research teams led by pathologists and anthropologists have been prying open Renaissance tombs and reliquaries to gather vital scientific data. One of the leading researchers in this field, University of Pisa pathologist Gino Fornaciari has spearheaded several of these projects, exhuming such Renaissance luminaries as Cosimo I de’ Medici, Ferdinand II of Aragon, and Maria D’Aragona, one of the greatest beauties of her day. I have met and talked at length with Fornaciari, and can attest to his interest in serious science. And I was really intrigued today when I checked out his recent publications to see what science had learned from all these rude awakenings of the dead. His papers covered a wide range of subjects–the methods that Renaissance embalmers employed to artificially mummify royalty in 16th century Europe; the species of lice that clung to the mummified remains of Ferdinand II (revealing that these parasites plagued even the wealthiest during the Renaissance); and the human papillomavirus (HPV) that infected Maria D’Aragona. The latter study will permit medical researchers to study the evolution of this important virus, a major cause of cervical cancer, perhaps giving them clues to new treatments. If the team that wants to open Leonardo da Vinci’s grave obtains permission to do so, I strongly suspect that they will make the most of this rare opportunity, gathering all the relevant samples and data to do key pathological and bioarchaeological studies. I personally don’t care whether the great artist painted the Mona Lisa in his own image. But I’d love to know more about the health and life of this great Renaissance artist.